USB Powered Stereo Speaker: USB powered computer speakers will fill the room with your music, movies, or computer games, Let you immerse in the world of vocal music. 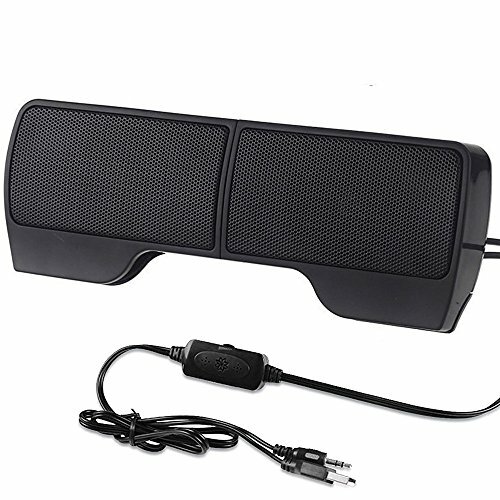 Clip-On Multimedia Speaker: The clip design allows the portable USB speakers to easily mount on the frame of device vertically and horizontally. Mount on the Frame of device with a minimum width of 0.28 inches to a maximum of 0.87 inches. Keep snap into place, no loose when moving my laptop around. Adjustable Volume USB Speaker: Turn the speakers on and the volume up with one simple control at the cable for quick access.t deliver the mind-blowing stereo sound. USB Power Speakers: Plugs directly into your USB audio port device for power. plug and play. Broad compatibility: Mini USB Speakers for Laptop, Notebook, Computer, PC, Phone Tablets. If you have any questions about this product by ELENKER, contact us by completing and submitting the form below. If you are looking for a specif part number, please include it with your message.